Mankind is an expression of God in self-evolution, but in oblivion of its true status and always labouring unconsciously towards the spiritual summits through the long curve of evolutionary Nature. In its secret principle, it is a conscious portion of the Divine, but outwardly an expression of a struggling ignorance trying to find meaning and purpose of its existence here. From the viewpoint of spiritual experience, from a consummating self-experience of the world through the Spirit, the whole of humanity must ascend into the higher nature of God and be transformed into a marvellous extension of God in the terrestrial. The individual is more magnified in stature and advanced in the ranges of his mental development than the humanity as a whole, but he is still an inseparable organ of it and bears all sense of humanity within him and idealises its progress to a great pragmatic self-development in the immanent Spirit manifest here in the physical. Without the possibility of an individual ascent, there can be no possibility of a collective ascent of humanity into the higher nature of God. Also, humanity shares a collective mentality and a collective vitality of spirit which are a storehouse of a trillion and more contradictions housed in a constricted space, and all sense of a collective harmony with a certain prominence of a few individual in the glory of their achievements can hardly be taken as reflective of a higher progressive curve for the humanity as a whole. The synthesis of the Gita points to a collective labour and fulfilment of humanity, though the context in which it is set up is individual, but it is also true that Arjuna is typical of a higher aspiration of humanity towards a more harmonious self-existence, free from conflict and lower ego and free indeed from fear, obloquy and self-loathing of the lower consciousness in ignorance, and it is out of this peculiar, yet effective example of an individual symbol-humanity that we have to develop a synthesis of a divine life upon the earth. Man seeks after a perfection and strives for a greater delight other than the moral and ethical amplitude of little earthly joys, but seeks them in the measure of his mind and in the strength of his vitality, more in the limited ego-figure of his outer personality than in the inner Divine. Still more erroneous is his sense of trust in the governing principle of lower life with which he often decides the motive of his action; for it is only natural that he cannot trust in the absolute wisdom of the inner Divine because he has no access to it or since, let us assume, he has some remote sense of the inner Deity and can seek its help and counsel, it can only be partially effective and of a limited aid only. The governing principle of life is founded on a mental model with a stipulation of imperfect laws of the intellectual mind and an overt emphasis on following the moral, ethical man with a stipulation of laws of his emotional heart. In neither of these conditions lies either the perfection or the delight and self-fulfilment of the inner or higher Divine. Rarely, we have seen an individual symbolic of a collective tendency towards progress and in the collective strength of his being, which is a derivation of a deeper sense of his unity with the transcendent Godhead within and without. To see God in humanity and humanity in God, to see humanity as an expression of God is the purpose of an individual self-realisation; it is also a sign of a progressive ascension into the nature of a higher Spirit other than the mental, moral and ethical selves of man, a cleaver-path to glory of the secret Light, to a large integral sense of inalienable unity in the multiplicity of God here in the terrestrial. An attempt to realise God in humanity is not an external pursuit of an intellectual knowledge trying to reconcile the various discords of collective life into a singe strand of a self-regulated existence, for external knowledge is a movement of a mind in half-knowledge and always moves away from all sense of innate unity of the Spirit in order to find it elsewhere in the external figures and terms of lower existence. And, in a limited, self-contained, self-regulated existence, there can be no possibility of a boundless movement of spiritual freedom or of its higher synthesis of divine unity; it can only put up a facade of a beautiful pretension and hide behind it all ills and imperfections of a mentally manufactured unity and conceal the heap of its falling structure. The Gita moves as much into an initial synthesis of human unity with the self-assertion of the Godhead as all and everything, everything animate and non-animate; even the stone, according to Him, contains as much Life as the most living and moving. At the root of this spiritual assertion of the Godhead is the living realisation of a vast and profound Truth, the basis of all existence here and above and elsewhere, and the Godhead himself is a higher term and expression of it, and to which and through the incarnate Godhead the humanity must ascend into its higher term and expression. There is God in humanity as He is there in the individual, and without humanity, the individual’s ascent makes no sense and is incomplete, and without the ascent and growth of the individual, humanity has no chance of ascending into the nature of God. The Christian idea of salvation, that of the exhortation of the biblical idea of redemption through a suffering God may seem noble at heart and viable as an alternative to the carnage of a battlefield; after all, to be killed and not to kill for God seems wonderful and an act of self-sacrifice for the salvation of the human race. Even the idea of passive resistance derives from a weakness of self masquerading externally as courage and conviction of a strong ideal. It is in the nature of a blind and ignorant humanity to follow these ideas and exhortations and seek through them the cross of its self-redemption and spiritual salvation from all evil and imperfection. If these ideas were true at all, it reduces Sri Krishna to nothing more than a bombastic, rowdy element seeking war and bloodshed and misguiding his disciple towards murdering his own kith and kin. It also reduces dharma to a mere puppet of our moral temperament and ethical composure, a dog-sledge of a high moral Godhead who shuns suffering and pain and carnage by replicating them in the high abode of his own Cross! Therefore, in these pursuits lie nothing of what we seek. Neither in the present forms and systems lie our path or method or our own systems of practical knowledge based on a greater unity of the divine Spirit. The forms and systems of the pragmatic divine Spirit have to be created by the effort and labour of a few individuals first before they can be replicated elsewhere and into the larger apparatuses of a self-governing knowledge of God in humanity. So, it is in these newer forms and methods of the immortal Spirit, in the special efforts and labour of a few self-conscious individuals lie the resurgence of Sanatana Dharma as propagated by Sri Krishna in the battlefield and a secret to a profound sense of spiritual unity of mankind. While we have spoken of the forms to be developed and methods to be employed, we have to bear in mind that all these efforts, changes and methods have to come from a self-aware Knowledge within or from above and not to be sought in the mind or in the confident bubble of a lower vital. 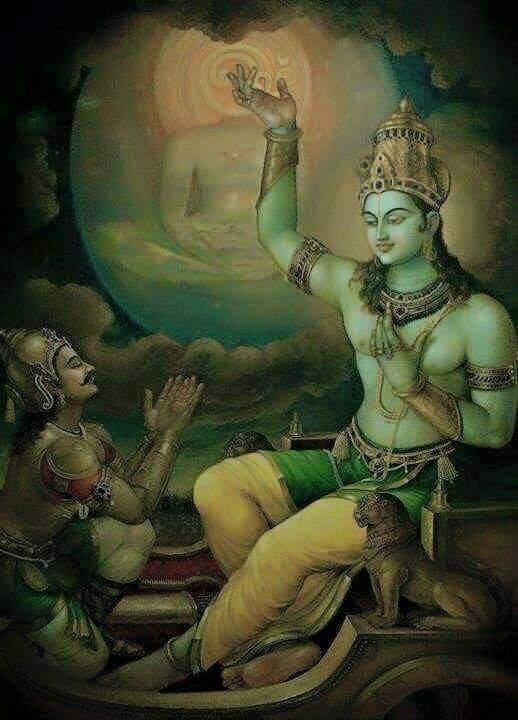 It was the same Knowledge that Sri Krishna had given to Arjuna in the middle of a battlefield, when the human disciple was caught in the mire of a familiar confusion and should decide as to which side he must lean to, either to the side of God’s Will in himself and in the world or to side of ignorance and darkness leading towards division and dereliction of God’s duty. It is not salvation or exhortation of a moral idea, but spiritual liberation within and without which is the basis of the Song of the Lord; the self-attainment to a God-Nature while in the physical and a conquest over the lower ego are the results of our self-surrender to Sri Krishna. It is not in the cross but in the heart of a happy, luminous abode abides the immense divine beatitude which we are seeking consciously or unconsciously. Dharma or the higher divine Law can only be founded in a self-conquered, self-mastered integral nature; it is not a random or absurd manifestation of a Siddhi in one part of the being while the rest are submerged in ignorance and darkness, for the true sense of self-conquest comes out of a complete abandonment of oneself and that all that one is into the Will of the Supreme Godhead, and therefore, out of it, the true sense of dharma. The foundation of dharma is the God within and without; it is His all-creative apparatus in which is cast and recast all movements of the world till they attain to His perfection in every detail of manifestation, and sometimes, some elements have to be dissolved or even destroyed in order that the newer and more harmonious elements have a better chance of perfecting themselves in the crucible of an all-transforming Light. This presence and process of an all-transmuting Light in the midst of a suffering humanity is the nature and being of an integral Truth-Consciousness and it is this Light out of which comes all our sense of both individual and collective unity and the necessary apparatus for those who are here to work out the divine transmutation under the conditions of a stressful ignorance and recalcitrant falsehood. Also, it is out of this inherent self-aware Consciousness comes the vision and realisation of an integral unity of both the individual and humanity as one self-expression of the transcendent Godhead. A manifestation of a conscious humanity with an almost infinite multiplicity of self-conscious centres or individuals is the evolving term of the manifest Spirit here. A dharma so fashioned out of the crucible of God is the only self-sustaining figure in the process of this evolving term of the Spirit in as much as its higher counterpart in the world’s play as the supreme catalyst of an impending and inevitable change of consciousness here in the earth-consciousness. To this all our aspiration and godward energies move for a synthetic self-realisation here as much as in the Supracosmic Light above.